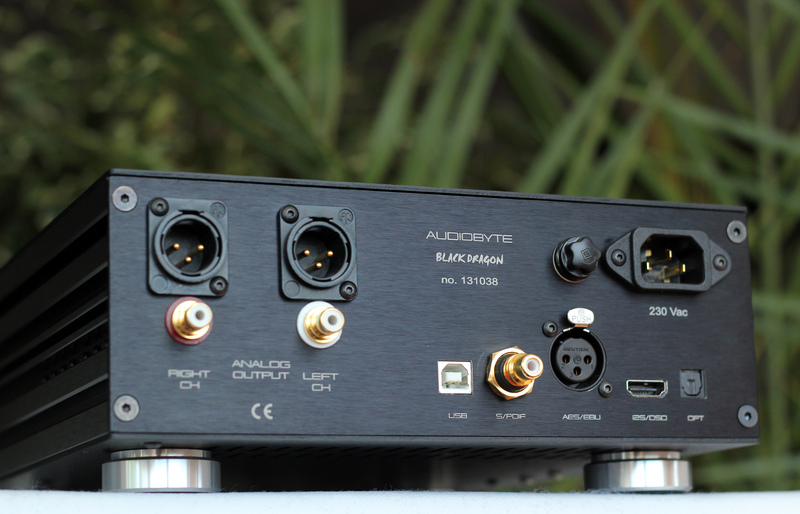 I’ve known of this project for a while now and if you’ve been reading some of my reviews, you would know I am really interested in Audiobyte and their products. I had Hydra-X for a while now and it really impressed me throughout the time. Let’s not forget about their top of the line DAC , the Wavedream, a product that I loved and thought to be right next to MSB Analog DAC. I finally have this wonderful product on my desk and it really looks and sounds wonderful. What is it? This is a very strong competition for my Burson Conductor or any similar unit, as it is a DAC / headphone amplifier / pre – amplifier . The minute I saw it, I was really impressed by its looks, and heard a dark voice deep inside me saying : “my precioussss” . So, I think it’s safe to say that I really loved the design and finish of the unit. 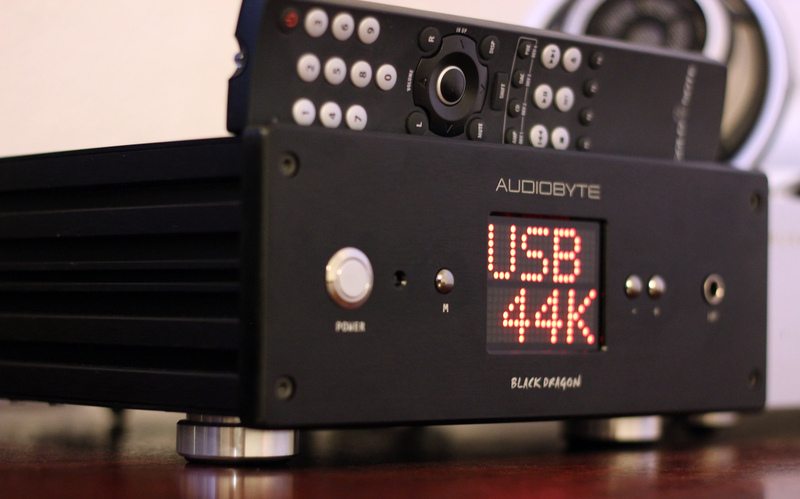 This might be the best looking product from Audiobyte yet. Everything is made of metal and it is well polished, especially the front plate that is thick and sturdy and has a very shiny and cool look. The Black Dragon is an updated Silver Dragon, a product that I never had the pleasure of testing. is a perfect complement to the digital input stage. Each dac chip is processing one channel in fully balanced mode which leads to better analog performance and noise rejection. is a high-performance upsampling block for conditioning the incoming signals. It is especially effective on standard resolution digital signals, like 44.1/48 KHz. With a large number of taps (1200) and a carefully adjusted response, the extension and atmosphere of the recordings are virtually enhanced prior to conversion. The filter can be enabled or disabled from the menu interface. For filter detailed performance consult the technology paper. 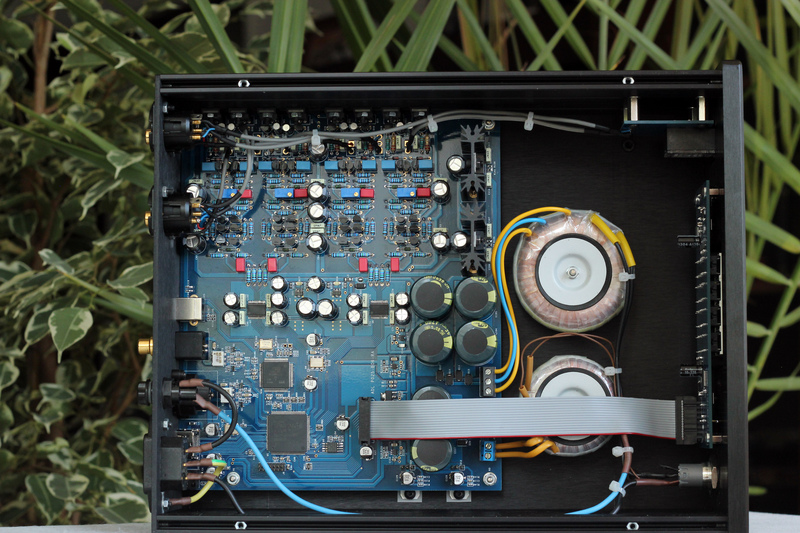 – all power supplies inside are linear type. There are a total of 11 linear stabiliser IC’s, 8 of them are low noise. The total filtering capacity exceeds 50.000 uF. The power supply is serviced by 2 separate toroidal transformers. So what does the Black Dragon bring to the table compared to the older version? Another important step ahead is the new asynchronous usb that supports up to 384 Khz for PCM and 5.6 MHz for DSD, compared to 192 khz and 2.8 MHz in the old Silver Dragon. The Black Dragon also has a bigger display, easier firmware update via the USB port and a 2 ohms output impedance on the 6.3 headphone jack, compared to 10 ohms on Silver Dragon. 1) Single Ended, 10Vpp max. 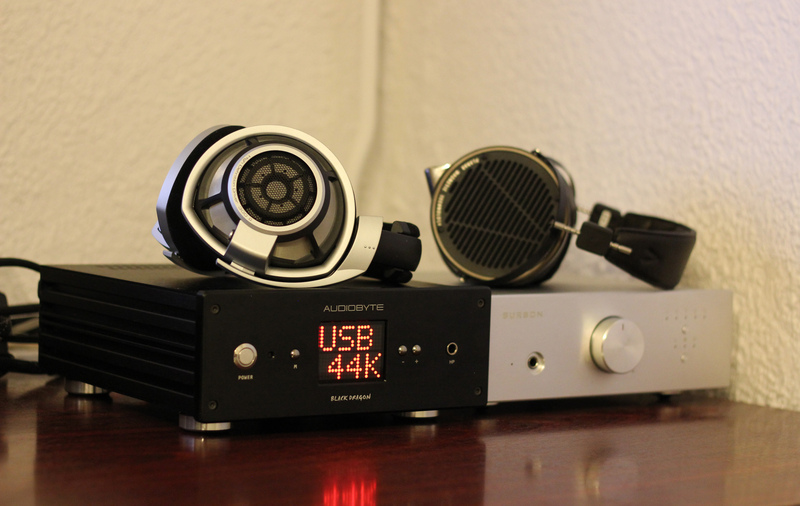 The tests have been done with Decware Taboo MK3, Audeze LCD-X with Toxic Silver Widow, Burson Conductor, Audiobyte Hydra-X, Sennheiser HD800 and AG500 Power Regenerator . Seeing the i2s input from Black Dragon, I couldn’t resist testing it with Audiobyte Hydra-X, as Hydra gives it’s best on I2S. The results were quite pleasant as it added some energy on the lower frequencies, giving another flavor to the sound. However, the usb input from Black Dragon was overall better, offering better transparency, instrument separation, soundstage, etc. The usb input and clocking from Wavedream was felt quite easily, offering the improvements above. It’s very impressive that Audiobyte managed to add this part from their top product and at this price. 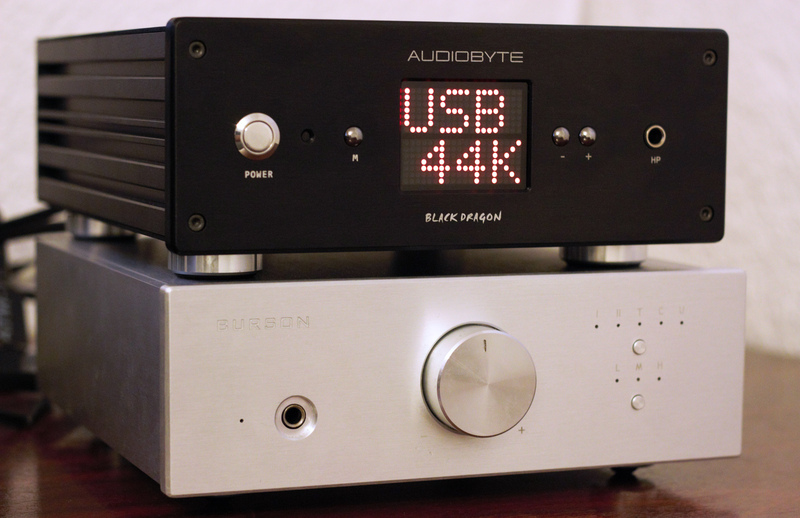 I’ve tested the unit just as DAC pairing it with Decware Taboo MK3 and Burson Conductor. While doing this i’ve been very impressed by the amplifier section of Black Dragon as well. 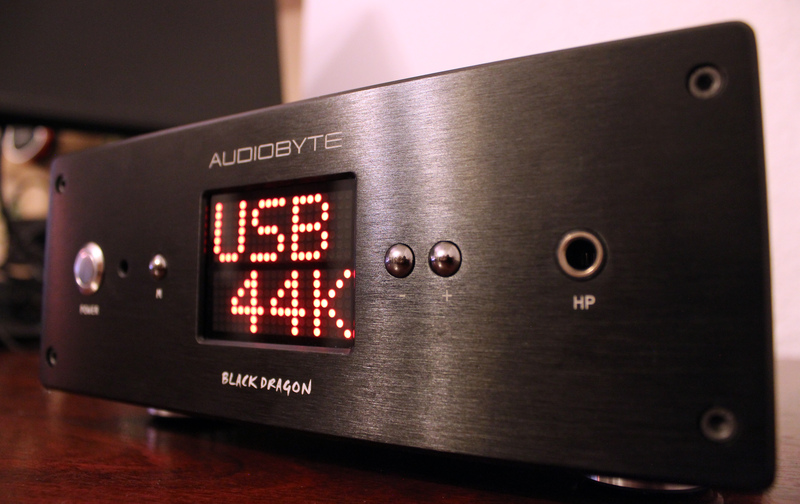 I’ve always expected Black Dragon to be a very good DAC, but I never expected the amplifier to be this good. The details are just amazing and come at you from every direction. I’ve lost myself between the wonderful instruments that tickled my ears, as everything was extremely clear and transparent like a clear mountain river. I felt like this song was not just music, but a full blown show where every sound started to dance and to fly from one layer to the other with acrobat skills and full of joy and energy. So yes, Black Dragon is one of those products that makes me loose myself in the music, forget all about my surroundings. I’ve told my friends a bunch of times that I like the sound better in a good system than going the the actual classical concert. Don’t get me wrong, I would still go, as I love the feeling and watching the artists. However, the sound experience could sometimes be better in a good sound system. This is the case with Black Dragon as well. The timing and precision of the sound was impeccable. The soundstage was very big and airy with a lot of space between the instruments and it was presented in a holographic / 3d manner. The crystal clear transparency offered a clean window to some sounds that aren’t that easy to hear on other systems, as between the sounds from the instruments I’ve also heard the artists inhale to play the flute, fingers touching the instruments, change of pages, etc. This song was hypnotizing even with HD800. Yes, the Black Dragon is an excellent match for it and in this case injected them with an energy shot. Everything was impressing, especially the heavy guitars which had an incredible extension, detail and impact. The first time the chorus enters in the song could be quite subtle, but the voices were very well extended with Black Dragon, giving them a lot more presence into the scene. The timing and precision is again mesmerizing, as every instruments hits with surgical precision. This song has an abundance of different sounds and instruments popping from nowhere and every one of them was incredible with Black Dragon. Ok, I had to wait a little to regroup, as I’ve been ambushed by Black Dragons. The guitars are just amazing with incredible attack and decay, leading to very energetic and strong plucks that just tickle your ears. The voice was the second part that left me speechless, as it’s extension and transparency are exemplary. The guitars from the beginning that come from both channels have a crisp pluck and seem to come from a perfectly black background. Hugh’s voice is very well textured, extended and very clean. The drums have a good and clean impact. Again, the soundstage was presented in a very grand and holographic way. The extension of the guitar is excellently detailed. The tonality of the sound is quite natural and makes you feel in the room with the artists, surrounded by guitars. I’ve recently been to Westminster Abbey and I just loved the chorus there and how it sounded in the Abbey. I’ve bought this CD from the gift shop and I was really impressed by the quality of the recordings. With Mr. Black the chorus and the greatness of the abbey was caught very well. The voices were very clean and well distinguished from each other showing excellent layering. The cello from the beginning has a very good presence and feel as it’s very well textured and very detailed, even if it’s subtle in a layer from the back. The hands and their rhythm is very well felt throughout the song with a good and energetic pace. The voice is clean and natural. When the drums hit in a distant layer, they have a strong and dynamic impact. The transparency and fluency of the sound is hypnotizing. The sound flows continuously and effortless, leading to a very natural sound that made me feel the guitar in my body giving me shivers. I could listen for hours and still not get enough. Mr. Black has some qualities that makes you feel in the concert hall. The contrabass has an amazing body and texture that makes you feel the depth of the room and even though I listened through headphones, I felt it in my body. The violins had a very holographic feel themselves and an echo that enlighten the room revealing it’s size. The bass is very clean and has a very good punch. While with a stronger amp you can get better depth and control, the bass is very enjoyable on it’s own on Black Dragon. The mids are excellent with great instrument extension and vocal performance, as the voices are very clean, well textured and natural. I like the treble very much on the Black Dragon, as it has very good detail and extension. It’s also very sparkly, but manages not to be bright, not even with HD800. The femtovox clocking system gives very accurate timing and precision to the sounds, leading to excellent imaging and instrument separation. The soundstage is presented in a holographic way. This is another very strong point of the Black Dragon. The instruments have a very full and detailed sound, and between the sounds from the instruments you can hear other sounds like when the artist changes the page, puts his lips on the flute, inhales, exhales, moving in the chair, etc. I found that every instrument had a very lively impact no matter how deep in the scene. The transients are very natural and fast, with very good impact and fast decay. Every pluck has a very energetic explosion with fast and natural decay. Ladies and gentleman, I present to you my new favorite full sized dac / headphone amp combo at the moment. It has an excellent DAC, a very good and clean amplifier and a lot of nice features like a lot of inputs, a remote control, balanced DAC, pre-amplifier, digital display, very good looks, etc. I found the DAC to be excellent and the fact that is comes with a very good clocking system (femto clock) and usb input that is taken from the top product from the mother company (Rockna) was easily felt in the quality of the sound. This is one of those products that when you start testing it, your wallet wants to quietly leave the room without notice. It knows that by the end of the testing that it may end up with a big whole inside. It’s one of those products that makes you think of a financial plan on how to get it. The good news is that the Black Dragon is quite cheap for what it offers. I think it would be very hard to find a good dac / headphone amp combo to beat it at 1500 eur. While at first I didn’t have very big expectations for the amplifier section of Black Dragon, thinking it would be under Burson Conductor, it really managed to impress me. Actually I ended up liking HD800 more with Mr. Black , as the sound was more transparent and cleaner, even though Conductor is more powerful and has deeper and more controlled bass. The Black Dragon also managed to drive LCD-X very good as well. Conductor had more control over LCD-X, offering a little more relaxed sound, more decompressed and with better bass depth, but there were still cases when I preferred the Dragon with LCD-X as the combination offered a cleaner sound overall. I even enjoyed it with the power hungry LCD-3, as Mr. Black kept it’s clean and transparent quality, but in this case, Conductor’s superiority in power was easily felt as it presented better dynamics and energy, showing more ease in moving the membrane. Letting the power aside, the transparency offered by the amplification section of Black Dragon is excellent and makes the product very appealing even from this angle. DAC wise there is hardly a competition between Conductor and Black Dragon, as I thought it to be clearly superior in this department offering an excellent performance for this price and even more, as it enters in Chord Hugo category, a category that can stand their ground even near much more expensive products. Considering all of the above, the Black Dragon earns my sincere recommendation, as overall it was the best dac/headphone amp/pre-amp combo I have ever heard until now. 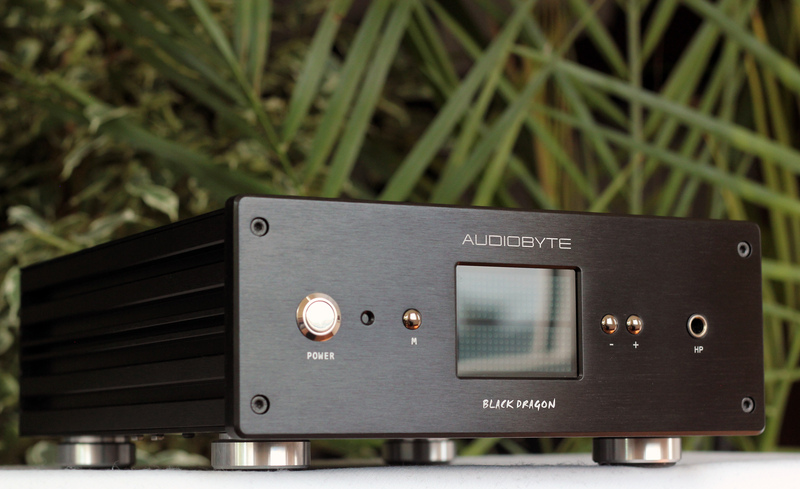 Besides that, it has an excellent DAC that can be used with pride in any high end system. Congratulations for yet another insightful review ! 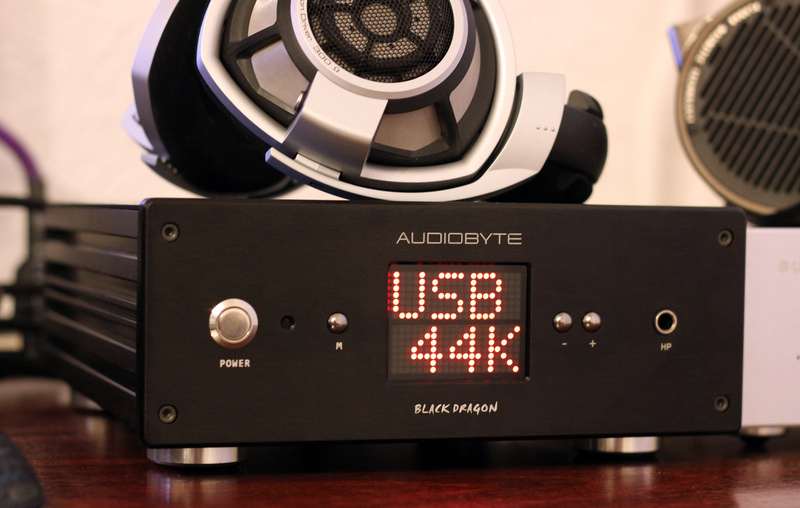 dac-wise, leaving HP amplification and hugo rainbow-lights and USB connections diversity aside, did you find black-dragon better sounding DAC than hugo ? the word out on the net is that “nothing beats an FPGA, you eventually hit the wall with any off-the-shelf DAC chip”; considering that the price is smaller than HUGO’s, I guess that BD is obviously better value….but does it really beats HUGO for sound ? Thank you. I didn’t have them side by side for a direct and correct comparison. From what I remember, Hugo had more details. I think that even if BD is a little behind Hugo DAC wise, it is however very close to it’s performance, and it still is a product that beats a lot of other more expensive products. Added the more powerful amplifier and all the inputs, Black Dragon is a very serious competitor to Hugo, if you think of Hugo just as a “desktop” solution and if you don’t care about the fact that Hugo is portable. And about the shelf dac chips, well, I think they are indeed a limitation overall, but besides FPGAS there are some other dacs that are very good as well the MSB dac chips for example, R2R dacs that can be found in MSB dacs but also in Rockna Wavedream for example. Letting that aside, Black Dragon manages to sound very good by it’s own, even if it runs on normal dac chips, it has the USB input based on FPGA tech. You won’t have to get another external usb converter like Hydra-X or Audiophilleo, as I think it is better than both. Going a bit off-topic, I once (just before buying FiiO X5) dreamed of taking a very good sound source “out in the cold” to use it as external DAC when playing music from a laptop to a PA system (mixer + some monster pairs of speakers and subwoofers) at the regular dance parties I attend with my friends; I’ve said to myself (and to the “sound in charge guy”) that it can’t possibly sound worse than his “realtek or whatever” onboard stuff; I was dismayed to realise that, although I was right, it was only me and my brother in law that commented on the (good)differences, the rest of the people just wanted “to hear the freakin’ music” and dance the night away, and that we all did; of course, we can discuss a lot about the rest of the audio chain, but I’m still skeptical that on these particular occasions casual-listening people would appreciate the differences. So that’s the reason why I’m not so exalted on features like portability and boasting among my friends on what a “hugo” toy can do with their smart phones on USB. On the other hand, I’m a bit worried by your last “con”: “Doesn’t have just DAC out that doesn’t use the pre-amplifier”; that means I can’t use fixed volume ? right now I don’t have a power amp, so a simple “line out” is a must. Yes, people perceive sound differences very hard at first because we are visual animals and we rely mostly on vision. However the ear train in time. Unfortunately it doesn’t have fixed volume and sometimes that comes out of hand, I know. This is why I have put it as a con. That oppo looks indeed very good. If I can get my hands on a unit, of course, I will review it. I have tested it but i haven’t noticed a big difference with the filter on. I agree about the amplifier. Dose Black Dragon can decode DXD 352.8KHZ? our local agent said turning the preamp section all the way to the max is the same as bypassing the preamp, can you comment? I have one at home right now, and I feel that at max volume (127) it’s louder than it should be. If price no object, and i only gonna juse it as an dac. Would i by Racna Wavedream Platinum xlr dac or Audiobyte Black Dragon? Wavedream is in another league when compared to Black Dragon, so if price is no object, Wavedream would be the clear choice! I’m looking around for a new dac and at first I was going for the Schiit Yggdrasil but just now I read your review on the Audiobyte Black Dragon. There is a price difference of a 1000 Euros and no need for the Hydra’s you say. If you didn’t look at the price difference, which one would you prefer? Well, Black Dragon is a good DAC as well, but yggy is more analogical and romantic with more slam on the bass. Is it worth the price difference? Well both dacs are very good for their prices. 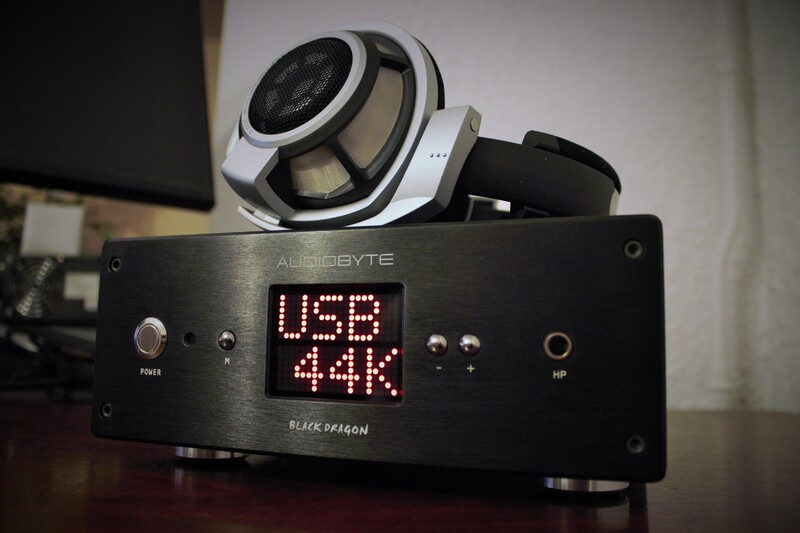 Recently I started looking for a new DAC/amp (around 1500 euros) to properly drive my HD800S (currently I use Fostex HP-A4 BL and Beresford Caiman SEG, and I consider none of these units drive them properly) and found your review about this model. Do you still use it, after all these years? Do you recommend it for the mentioned headphones? Also, how is the RCA analog output (do you think it will be a good pair with a SET tube amp)? Is it clean and detailed?